The latest edition of Talking Bull, the Independent Hereford Football Club Supporters’ Magazine, is OUT NOW! THE NEXT GENERATION – the latest issue of Talking Bull will go on sale outside the stadium for the first time this Saturday, 3rd November 2018, ahead of the home Vanarama National League North match against Altrincham so look out, and listen out, for our volunteer sales team outside the ground this weekend. Initial supplies have been placed in our Herefordshire retail stockists at Club Sport, South Street, Leominster and copies will also available for purchase from the Hereford Club Shop, Edgar Street from Saturday afternoon. Issue 114 is another bumper 48-page edition packed solid with content, as we interview the new Hereford FC Head Coach, Marc Richards, and look back at the history behind the last 21 managers we’ve seen at Edgar Street. We scan the murky depths of the Boardroom, consider what it would be like living next to Ryan Green, we welcome new signing James Roberts, and find out what Gavin McCallum ever did for Hereford. We’ve our usual in-depth study of upcoming away days with both Ground and Good Pub Guides, plus much, much, more. We also bring you the best from our plethora of contributors; with more new writers making their Talking Bull debut! 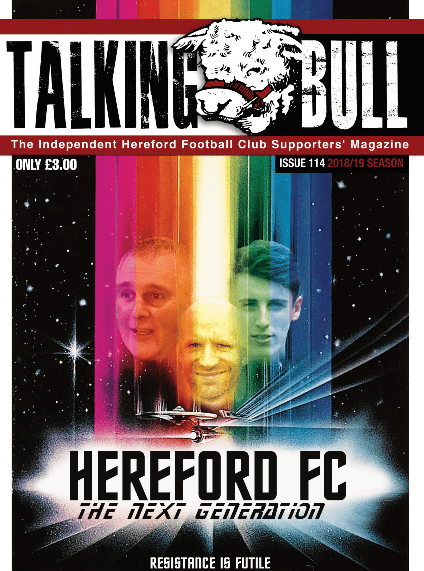 This issue of Talking Bull retails at the normal price of £3, but if you are unable to visit Edgar Street or watch Hereford ‘away’ games when the fanzine is often on sale, why not consider subscribing. You can even purchase this edition of Talking Bull on-line, just follow the links within our on-line store. Subscriptions are on an eight-issue cycle, and you are reminded ahead the final date of this period, thereby ensuring you don’t miss a copy of Talking Bull, the best fanzine in Non-League football.